A key skill working online is working out strategies that save you time. Saving time while maximizing outcome. Learning to focus on what you want to learn – you don’t need to follow every link, think about every conversation. Learn to let go! And when you’re participating in a connectivist MOOC like ETMOOC where over 1,500 participants are interacting through their blogs, Google+ community, through the ETMOOC Twitter hashtag and a wide range of tools working out strategies to work smarter are essential. Off course developing strategies to work smarter is often easier said than done especially if you are new to this type of learning environment. That’s where someone like me comes in. As an experienced user I’m constantly fine tuning my strategies to work smarter. Here are my strategies for working smarter as part of ETMOOC that will help you! Take ideas from what I do and then find what works best for you! I’ve included tips for those who have an android tablet or iPad as they both are time savers since the apps make reading and interacting faster than using a computer. Trying to focus on the chat, what’s being said and the Whiteboard can be overwhelming. Don’t stress or worry too much about keeping up. You can easily save the Chat log and Whiteboard just before you leave the session; and then reflect on the conversations in your own time. 1. Go to File > Save > Chat and save the chat log. 2. Go to File > Save > Whiteboard and save the whiteboard as a PDF. 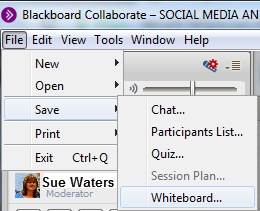 Some participants have had issues logging into the Collaborate sessions. The best option is to visit the Blackboard Collaborate’s System Requirements page to ensure your systems meets their requirements and to test it using their configuration room. All recorded sessions are archived here. 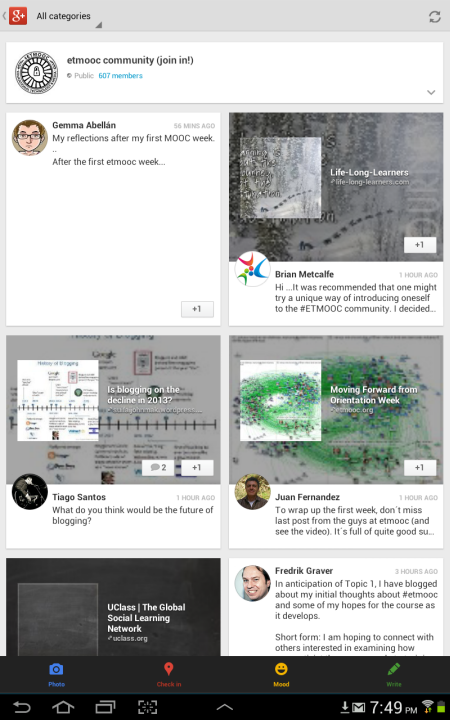 The Google+ ETMOOC community has been so active that email overload has been an issue. 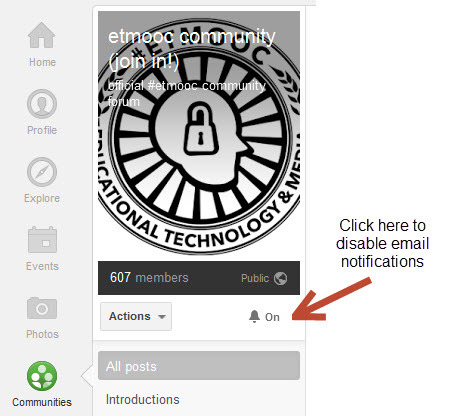 Then all I do is twice daily check the Google+ ETMOOC communiity and quickly review that latest updates. You can learn more about using Google+ here. Next tip is it is faster to interact in the Google+ community using the Google+ app on an Android Tablet or iPad. Also works quite well on an iPhone. All I do is twice daily load the Google+ app on my Android tablet and quickly review that latest updates. Here’s how to set up Google Reader if you’ve never used before. It’s faster to quickly read recently updated posts. The full post is pulled into Google Reader, unless the blogger has used the Read More tag, so you can easily read the entire post inside Google Reader whereas only the post excerpt is display on the ETMOOC blog hub page. 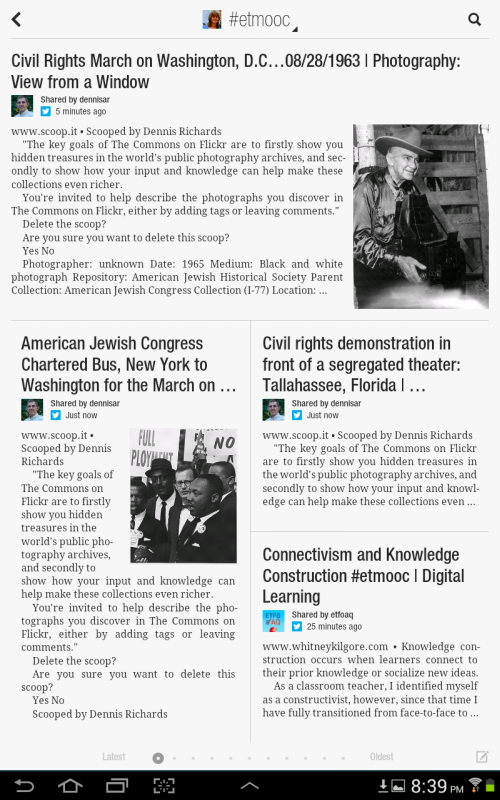 Alternatively you can use a magazine style app like FlipBoard (use http://etmooc.org/hub/feed/ to subscribe using Flipboard). Magazine style apps are personal preference. I prefer to easily read the full post using the Google Reader app whereas magazine apps show the post excerpt in a magazine style layout. Below is what a post looks like in the Google Reader app. Below is what the feed looks like in the FlipBoard app. 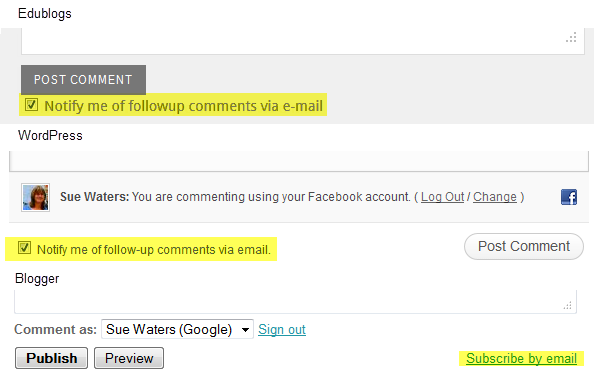 When you leave a comment on another participants post select the subscribe to email notification of new comments if they have this option. This notifies you of any further comments on that post and makes it easier for you to continue the conversation in the comments — if you choose. A twitter client is a MUST as they provide instant notification of the latest updates and easy response to the tweets. Which Twitter client you use is personal. If you are new to Twitter start by first checking out this Twitter Guide. 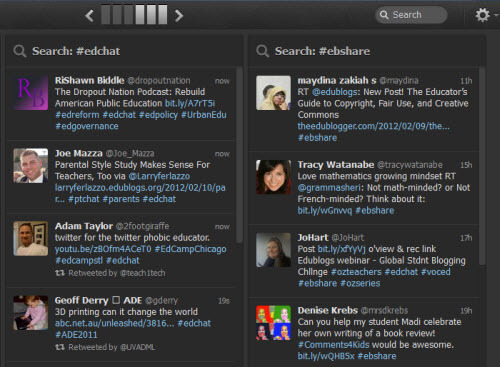 TweetDeck – on my computer. Here’s where you’ll find information on setting up TweetDeck. 1. Add your hashtag term to the search box in TweetDeck and press Enter. 2. When the search window loads click on Add Column. 3. Your search column will load in TweetDeck and all tweets using that hashtag will be updated as they’re tweeted. There’s a range of different apps you could use to monitor the ETMOOC hashtag on Twitter however personally I think FlipBoard is one of the better options as it pulls in the post excerpt, videos and images if someone shares links in their tweet. Here’s where you’ll find information on setting up FlipBoard. 2. 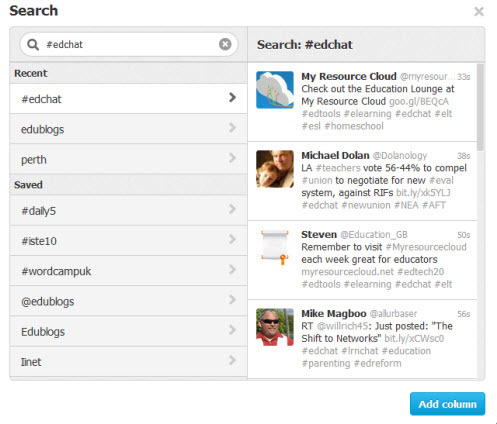 Add your hashtag ( #etmooc) to the search field and tap on search. 3. Tap on the + sign next to Tweets mentioning your hashtag to add it to your FlipBoard. IFTTT is a service that allows you to automate tasks. It is pronounced like ‘gift’ without the ‘g’ and stands for “If this then that’. 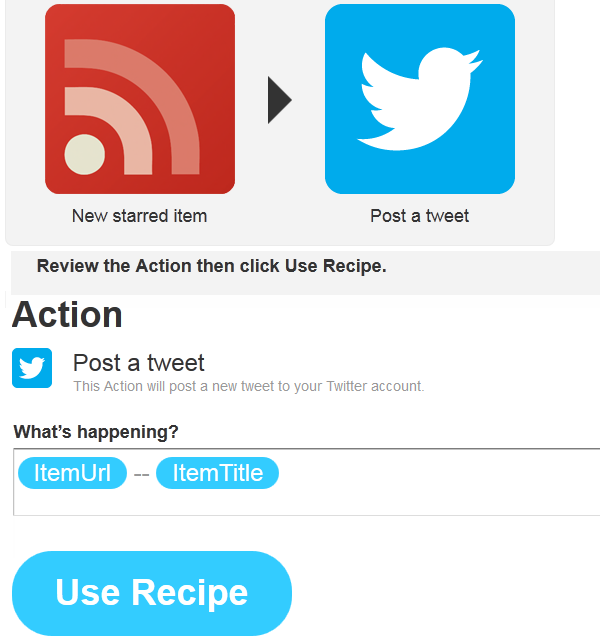 What you do is set up different IFTTT recipes for the task you want to automate and each recipe is a combination of a trigger and an action. For example, I can easily share posts I star in Google Reader with my Twitter followers automatically using IFTTT. It sounds more confusing that it is! 1. Sign up for IFTTT account. 2. Go to Browse Recipes and find the recipe you want to use. Just add the search terms and click Search. 4. Click on the Arrow next to the recipe you want to use. 5. Click on Activate under each channel first. Follow the instructions to authorize IFTTT to access the channels. In my example. I have to allow it to access Google reader and Twitter. It’ll ask you to log into your account and then Authorize access. 6. Scroll down and review what the Recipe does then click Use Recipe (if you want to use). You can customise the recipe to suit your needs. For example, I changed the order to tweet Item title and then Item URL. 7. Now when I star a post in Google Reader it is shared automatically by my Twitter account. 8. IFTTT doesn’t process your actions immediately. It’ll tweet links to starred Google Reader posts several minutes after I’ve starred them. If you want to check if your recipe is working properly just click Check Now and it’ll immediately trigger the action. 9. You can disable a recipe at any time by clicking on Turn off. You can use IFTTT to automate a wide range of processes. Check out IFTTT recipes others use for ideas and think about the tools you use regularly to see if there are recipes that will speed up the process. Tweet starred Google Reader post recipe – good for sharing posts you recommend to others on Twitter. Send Favorite Tweets to Evernote (workaround to Twitter trigger ending) recipe – great for collation links from Twitter to Evernote to refer to later. Tweet my blog post – good for automating the tweet of blog posts. When you’re new you think you need to know everything and keep up with it all right now! You don’t! Learn how to interact more time effectively reading blog posts. using Google+, Twitter hashtags and then focus on learning what you want to learn. You don’t need to follow every link, think about every conversation. You can always come back or ask others to help fill in the information you missed. These are my tips and what speeds up the process for me. There are lots of different ways you can work smarter rather than harder. What has helped you? What advice would you give others? Is there anything I’ve included that you want covered in more detail? I’m always looking for ways to be more efficient, as well as interact/connect more regularly. Thanks for posting this Sue. It really helped me with how I can manage all of the information coming my way. It has been a week of information overload. I think I will definitely be using flip board. Glad my post helped! Some people read all their subscriptions in FlipBoard as they prefer the magazine style. I tend to go between FlipBoard and Google Reader depending on what I am doing. Just doing a quick test of the anti spam word. Hi Sue. I just can’t see how this blog entry can be more useful. A big THANKS to YOU for your help and encouragement. Hi Max, really glad my post has been helping you. I have thoughts of things I could add but it is a very long post (not that long compared to some of my posts) but longer than some of the participants are probably use to. Glad my help and encouragement is helping! Thanks so much – very helpful as always! Yep. Your posts are very useful, indeed! Now, I’m trying out IFTTT. I’ve just created some recipes. Later on, we’ll see how they work for me. IFTTT is a really simple concept but in being so it feels a bit confusing when you first start using. The best part of it is you can set it up, automate the process and it does the work for you. 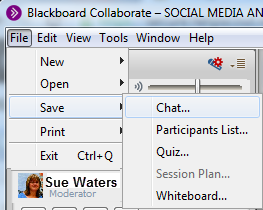 Hi Sue, I think you have saved my #etmooc mind! It’s great to have someone say “Don’t try and read it all.” cause that’s what I had been trying to do and wondering why I was going mad and I even started avoiding the computer completely! Hi Carolyn, I’m pleased to hear I’ve saved your mind. I wrote the post because participants were finding it hard to keep up. There can be a lot of pressure to feel that you have to do it all now. You don’t. I’m constantly making decisions on which aspects I want to focus on and not stressing about what I can’t fit in. For example, I understand the value of curation skills, I know what is involved but I’m not the best curator or social bookmarker. Am I going to address this? Not at this stage because I already have the skills, if I increase my curation I decrease the time I’m spending on other aspects, I generally know where the best resources are located or know who to ask if needed (if any one asks for information) and there are lots of people already doing great work curating. We can always come back later. Some people thrive on the pressure while others find focusing on quality over quantity is their better approach. Hi Sue …. On behalf of all the #ETMOOC-ers, I want to thank you for your Blackboard presentations on blogging and the extremely practical and fact-filled informative posts that you have shared. I just started using Google + and I am still trying to figure out the mechanics and who are my “friends” and “followers” in this new learning environment. 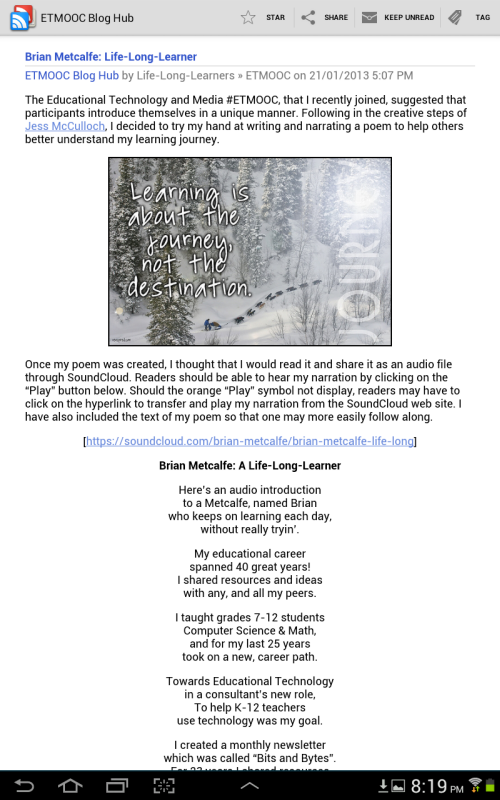 As such, I have been negligent in acknowledging sooner this post that captured my introductory poem from Life-Long-Learners.com blog. You utilized it to demonstrate how RSS feeds display differently in Google Reader and FlipBoard. You are to be commended for you ability to synthesize the dialogues and questions that evolve during the Blackboard & Twitter sessions and then write a comprehensive blog post that provides answers in a meaningful and non-threatening manner. Your time-saving tips are most welcome and I am eager to try out “IFTTT”. Glad my posts help. IFTTT is handy but can be a bit confusing initially. Please let me know if you need any tips! Thanks so much for this…a fantastic resource. I have had Flipboard for quite a while and did not realize it could do all this. I am also in the process of setting up an IFTTT account. I am new to Google+ and I just realized today that I had to request to join the community, so I don’t think I can post this question there yet. I notice that there are many blog posts reposted in Google+. Is this necessary if there is already a blog hub/google reader RSS stream? I see that there is value to Google+ (hangouts, conversations, etc.) but I feel a little bit overwhelmed with the stream of information to begin with, let alone having to go over it twice. However, if this is expected, then should I also repost? The great part of FlipBoard is there are so many uses for it. You’ll find IFTTT really handy once you work it out. Good question about Google+ and I’ve been reflecting on this as well. Personally I think it is better to let the posts feed through to the hub and to tweet the post out using the #etmooc hashtag. It is better to leave Google+ for mainly discussion. I’m sure those that are sharing via Google+ are concerned that maybe their posts are being missed in the Feed or that some people are relying on the Google+ to source their posts and aren’t reading the Blog hub feed. It’s a hard choice 🙁 I’ve shared a couple of my posts because I wasn’t in the hub feed and have now rectified this. Trouble is if everyone posted links to their posts in Google+ it would dilute the ability to manage it. I’m reading on my tablet so if someone is posting links to their posts it is quite fast to skip those posts. Lost of links to posts when reading on a computer is a bigger issue because Google+ loads slower on a computer. Thanks, Sue, for all of this detailed information. The screen captures are particularly useful.